In the eternal breakfast battle between pancakes and waffles…I firmly stand by French toast. That’s not to say I don’t love the other two. I do – just in a much smaller capacity. I’ve always been a big fan of the eggy, cinnamon-kissed, pan-fried slices of thick bread. I remember Nana sprinkling them with granulated sugar as a kid, and I do the same from time to time when I’m feeling nostalgic. Nowadays, though, it’s usually butter and pure maple syrup or honey. Grown-ups are allowed to eat all that sugar. My dear Nana also never bothered with brioche or challah bread when she made French toast. Standard sandwich bread was her go-to. While it was always perfectly delicious, I haven’t made it that way since discovering the rich goodness that is brioche. 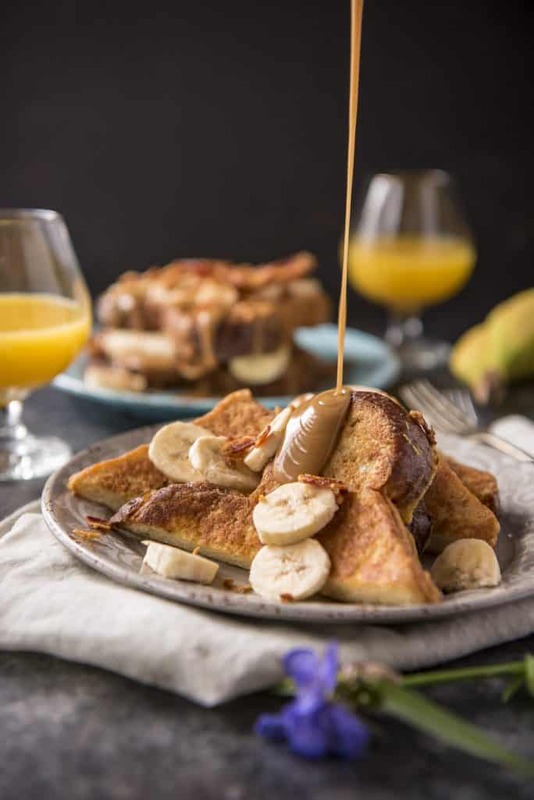 This easy brioche French toast is something all you sweet breakfast lovers should try at least once in your lives. You can find it in many stores (I’ve personally gotten it from both Aldi and Trader Joes), but using a homemade loaf of brioche is doubly satisfying. I promise you’re bound to feel like Suzy Homemaker if you go full-on DIY with this one. Especially if you’re aiming to impress and delight! 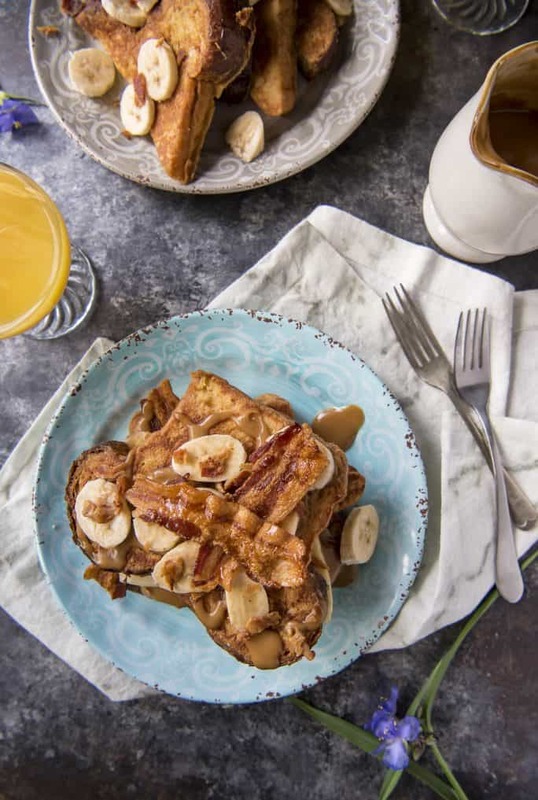 This Elvis-style French toast recipe is written for two but can be easily doubled or multiplied. It’s as perfect for large holiday breakfasts as it is for lazy weekend brunches. The extra steps involved (bacon frying, banana slicing, syrup mixing) are things that can easily be done while the bread is frying. So…what do you mean by an Elvis-style French toast recipe? The Elvis-style association comes from Elvis Presley’s adoration for peanut butter and banana sandwiches. There are many differing accounts of what his favorite sandwich actually consisted of, but they all contain consistent ingredients. Many restaurants and numerous cookbooks feature “The Elvis” (or at least their version of it). 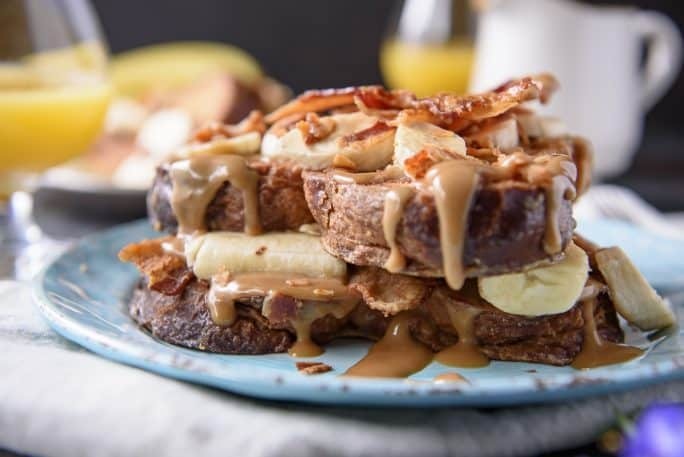 Some recipes call for the sandwich to be fried on a griddle, so a rich brioche French toast recipe in honor of him (and his indulgent taste in sandwiches) made sense. Besides, I wanted a reason to make peanut butter syrup. You’ll understand why when you try it – it’s so embarrassingly simple but so so good. 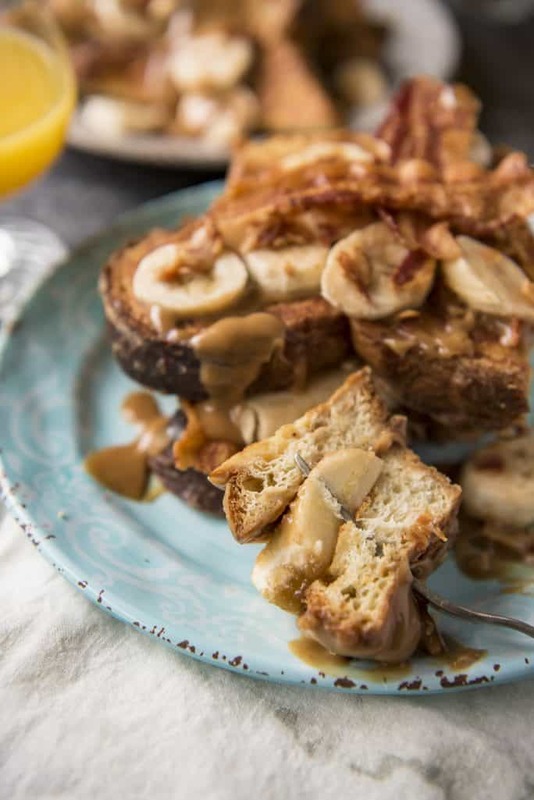 Is this the best French toast recipe out there? You be the judge. For me, if it involves bacon, it’s a win. 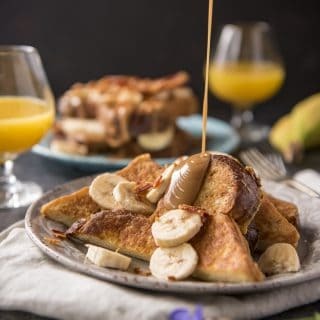 I usually can’t handle peanut butter-banana sandwiches, but in this French toast recipe, they strike a beautiful harmony. Plus, come on – there is peanut butter in the custard mix. All you PB lovers out there are gonna go nuts for this. If you really want to one-up me, here, add chocolate chips on top of the hot, freshly fried French toast. Watch them melt, drool a little, don’t forget your insulin shot. 1. Heat a large skillet over medium heat, or a griddle to 350 degrees F.
2. In a large bowl, whisk together eggs, milk, warm peanut butter, melted butter, honey, vanilla extract, cinnamon, nutmeg, and salt. Pour the egg mixture into a shallow bowl or baking dish. Melt bacon grease or butter in a skillet or on the griddle. 3. Working in batches, dip thick slices of brioche, one at a time, into the egg mixture and hold down for 3-4 seconds before flipping to coat the opposite side. 4. Place bread slices in the skillet/griddle and cook until golden brown, about 3-5 minutes, depending on the thickness of your bread. 6. 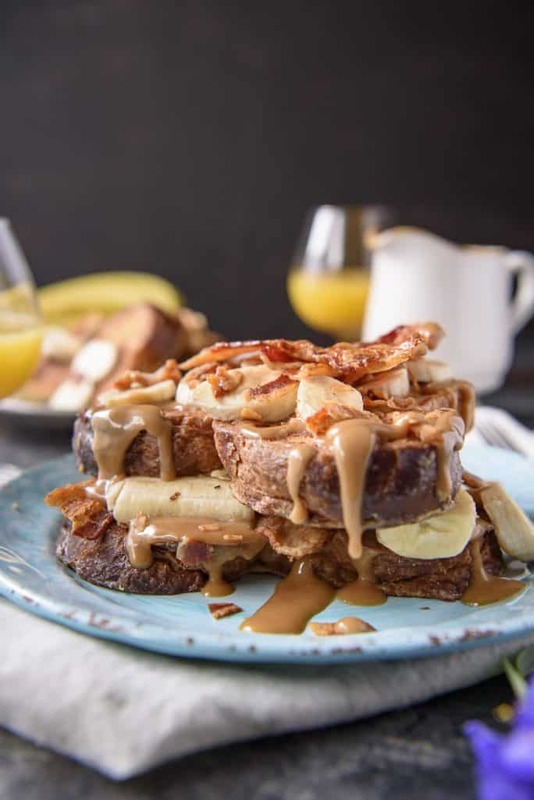 When ready to serve, layer banana slices and crumbled bacon on one slice of French toast, then stack another slice on top and repeat. 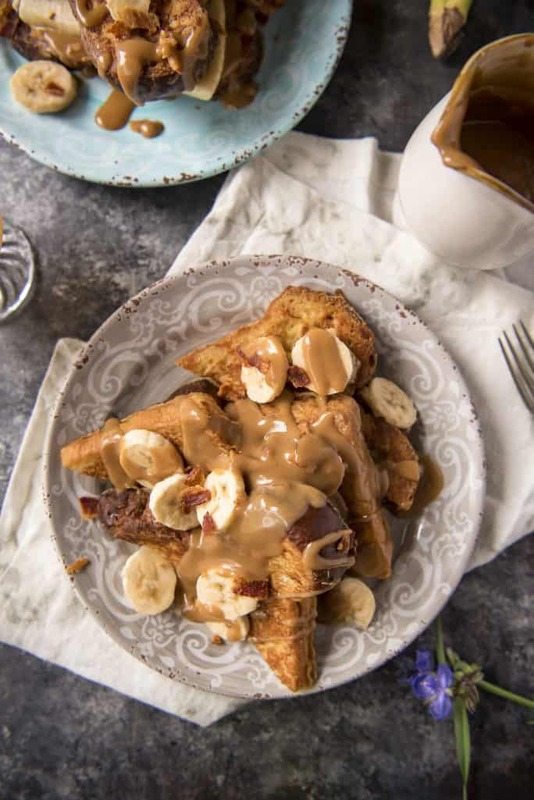 Serve with generous amounts of peanut butter syrup or maple syrup. Use slightly stale bread! A loaf of brioche that is a couple of days old will soak up the moisture of the custard mix better, ensuring no dry spots in your toast. If you don’t have old bread, simply leave the loaf exposed to the air for a few hours before you use it to dry it out. Keep the slices thick…but not too thick. 3/4 to 1-inch is just the right ratio for hearty French toast. Thick enough to stay together after soaking, but not so thick that it doesn’t soak through or cook completely. This makes brioche (or challah) the perfect bread choice for French toast. If all you have is sandwich bread, don’t fret – just take the slices out of the custard mix sooner. Get the custard ratio right. Eggs and whole milk or cream are essential to a good French toast. They’re also a meal in themselves – scrambled eggs. Serving scrambled eggs with your French toast is fine, but don’t make yourself scrambled French toast. Aim for a ratio of ¼ cup of milk and 1 egg for every 2 slices, then feel free to go crazy with your flavorings. Choose your own sweetener. I used honey in this recipe to enhance the peanut butter, but if you’re not a fan, swap in what you like. Powdered sugar dissolves better vs. granulated, and brown sugar creates a nice caramel flavor as it cooks. Don’t shy away from bacon grease. If you cook your bacon on the same griddle or skillet as your toast…leave the grease behind! 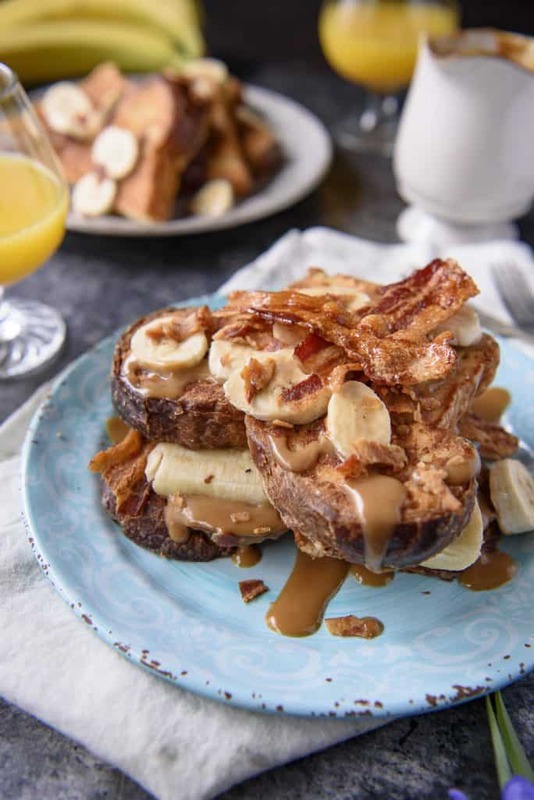 Butter is the traditional medium for cooking French toast, but let’s be honest – bacon is in the very name of this recipe. If you’re uncomfortable with that much grease, scrape half of it away, add some butter, and fry away. You’ll end up with an amazingly crispy outside and a tender, fluffy inside, plus the bacon flavor will come through even more. Got a sweet tooth in the morning? Here are some breakfast recipes you HAVE to try! Heat a large skillet over medium heat, or a griddle to 350 degrees F.
Whisk together eggs, milk, warm peanut butter, melted butter, honey, vanilla, cinnamon, nutmeg, and salt in a shallow bowl or baking dish. Melt butter (or bacon grease!) in the skillet or on the griddle. Place brioche slices, one at a time, into the egg mixture and hold down for 3-4 seconds before flipping to coat the opposite side. Place bread slices in the skillet/griddle and cook until golden brown on each side, about 3-5 minutes, depending on the thickness of your bread. Keep warm in the oven until ready to serve (no longer than about 40 minutes.) 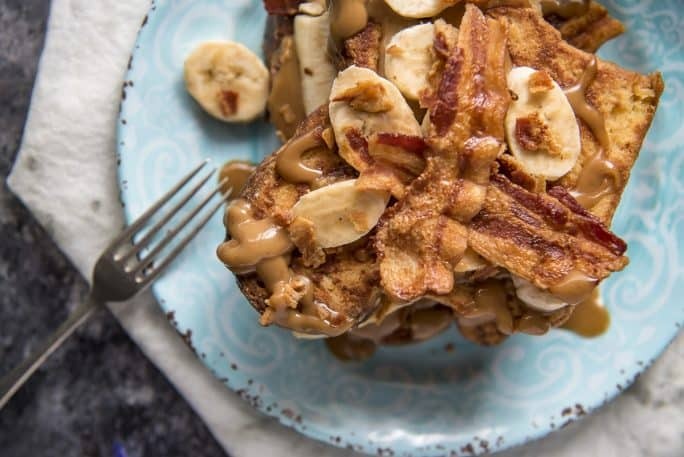 Layer banana slices and crumbled bacon on one slice of French toast, then stack another slice on top and repeat. Serve with generous amounts of peanut butter syrup. 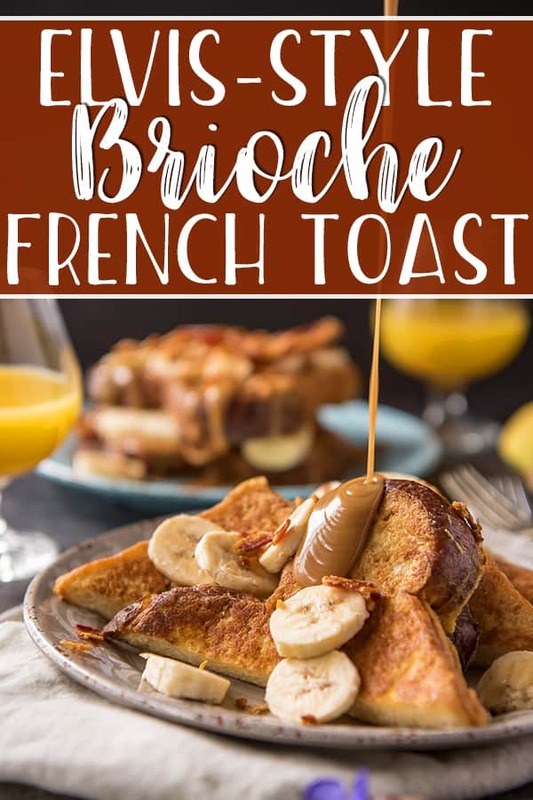 PIN THIS EASY BRIOCHE FRENCH TOAST RECIPE FOR LATER!